A note about writing this. My initial intent was to post a bit about what it’s like to live in a small space but as I worked on that post it occurred to me that for my own purposes I’d like to have a more complete story of this process. I thought it would be interesting enough to offer more details is a series of posts so, I present you with part 1. Camping during construction. My niece and nephew. In the spring of 2008 I made a decision to begin a new living arrangement. With the economy tanking and my life in a period of transition I put thoughts of moving to Maine or Oregon on hold and decided to stay closer to my family in Missouri. With the help of my brother-in-law Greg (who is the real builder) we began a project the family had long talked about. A little village of sorts on our share of land that had been left to us by our grandparents. Now, before I get into the story I should offer up that I am not a builder. My first recollection of building things was watching my parents help my aunt and uncle as they built a barn and house. But the adults worked, the kids played. I didn’t learn much. A few years later I remember helping my dad build our deck. I should add that my dad is also not a builder. My recollection of the process was one of frustration. My dad’s frustration as well as my own. In the end we had a very nice deck but I don’t recall it being an enjoyable or rewarding process. 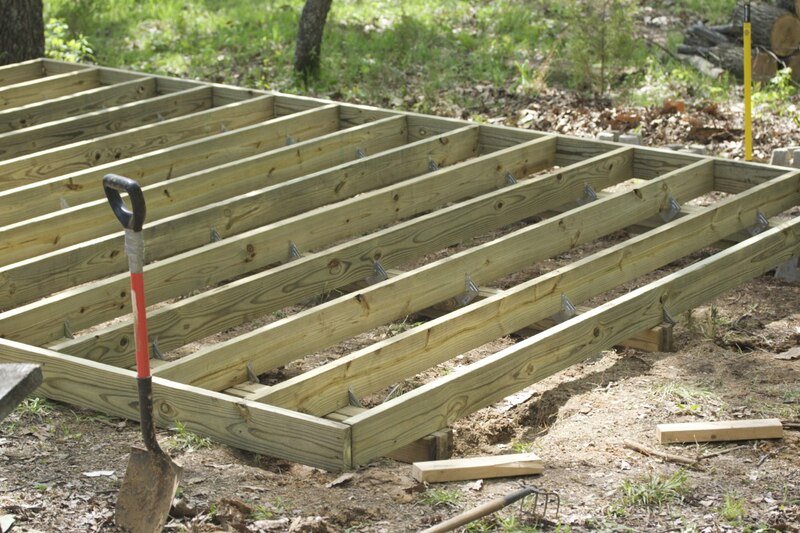 It may well be that I was just a bratty kid that didn’t want to spend his precious weekend helping build a deck but other memories reinforce the idea that my dad was often frustrated when trying to take on such projects. He wasn’t confident and didn’t enjoy it or at least that’s my recollection. I say this to help explain my own adult tendencies to avoid construction projects and my own lack of confidence in such endeavors. 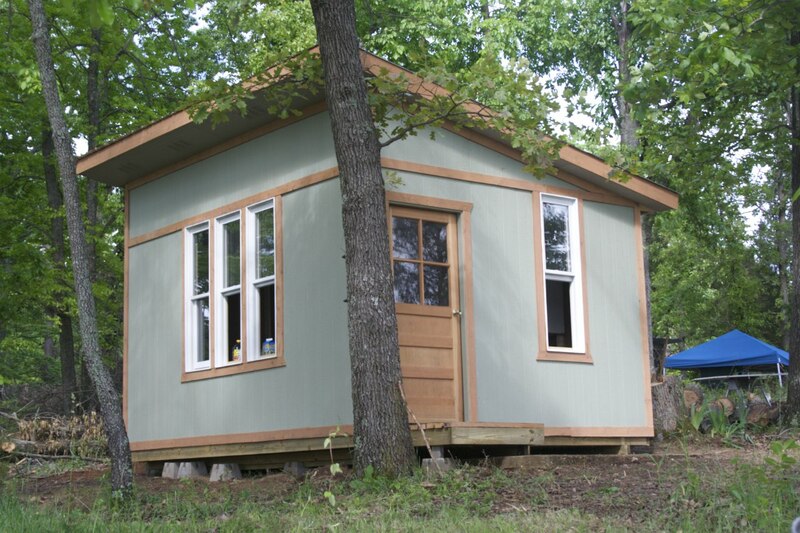 But in the spring of 2008 I did want a cabin and I wasn’t prepared to pay for one. Given that we had larger plans for multiple tiny buildings the choice to learn and work was obvious. I knew some of the basics. Previous experience (as an adult) included replacing a part of the roof at deCleyre as well as helping a friend with a roofing job. Also, I’d helped Greg on a few renovations of their home. He had the experience and had a pretty good idea of what he was doing but I’m observant and had watched him closely. During their home renovations I’d used a nail gun, hammer, circular saw, sawzaw, jigsaw and drill. I had a pretty good idea of what it meant to build a standard 2×4 wall. I ran the electrical wiring and helped put up the drywall. 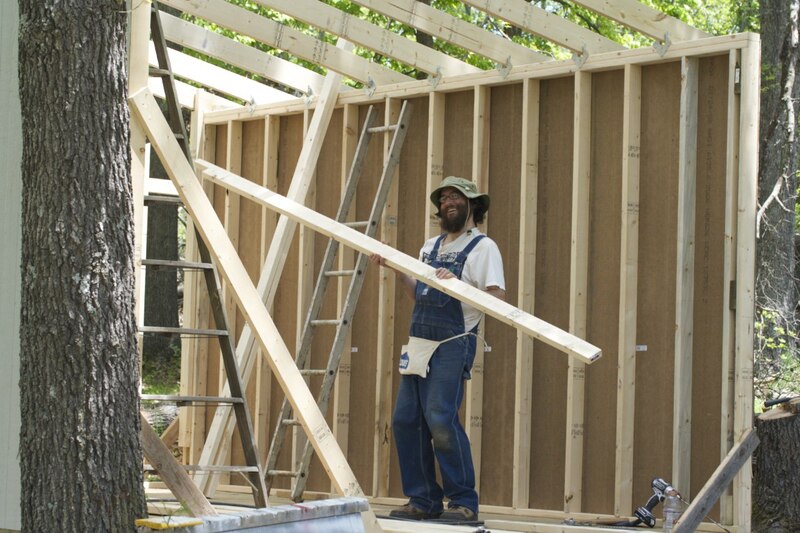 I knew the building of my simple one room cabin was really just a process of building a wooden platform, four 2×4 walls, and, finally, a roof. Then all the details of adding in windows, doors, outlets, insulation, inside walls, etc. Not only did we build my cabin but we renovated a shed and built 4 other structures. At this point I don’t doubt that I could build a cabin on my own should I need or want to. Thanks Greg! 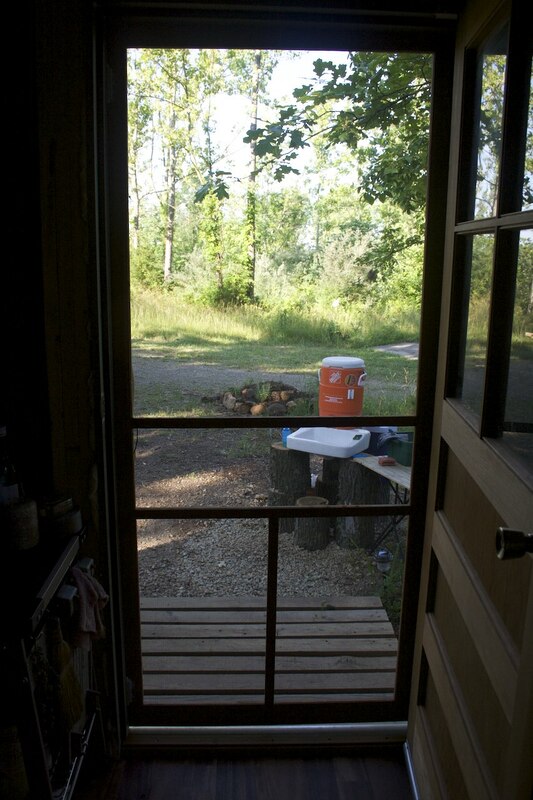 Our first building on the property was an outhouse because we knew we’d need some sort of facilities. We had that built in a weekend. It was a simple structure designed so that I could easily empty a large bucket when full. I set-up an out of the way area for a humanure compost pile which can be safely used after a couple of years . 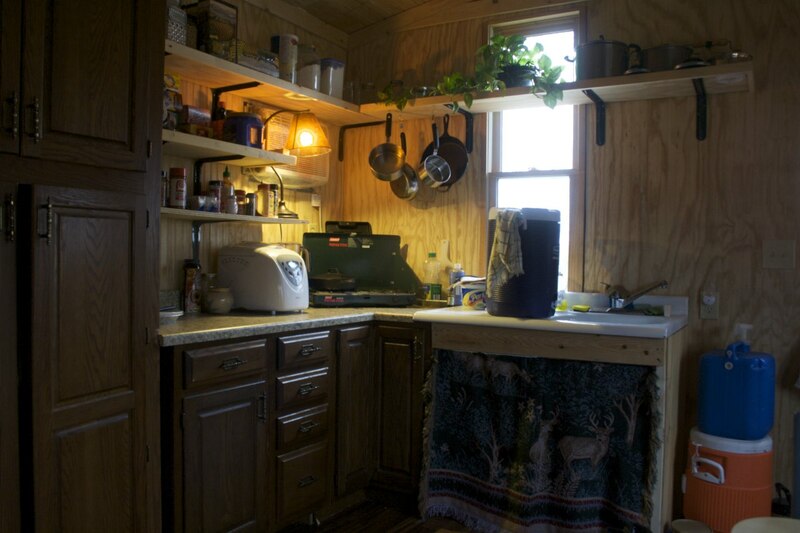 The following weekend we set-up tents and an outdoor kitchen in an old shed. Then we spent a month (weekends only) building my 12×16 cabin. The plan for the cabin was simple. I needed something big enough to live in. I don’t own much so basically a single, multipurpose room for sleeping, working, hanging out, food storage/prep and eating. No bathroom as I planned to use the outhouse and bathing would be done outside with a solar shower and then I’d have figure something out for the winter. Looking back on it now there are two things I would have done differently. I would have insulated my floor and I would have built it bigger to accommodate a small bathroom. If I’d gone just 4 feet more, 12 X 20 instead of 12 X 16 I’d have more room for the bathroom. But that’s it. Generally I don’t mind the lack of a bathroom but if I stay put for the long haul I’m likely to want the convenience of one. As I expected I have found that living in a small space has worked very well for me but more about that later. We arrived to begin work on Friday night. We set-up camp and cleaned the cabin site a bit. 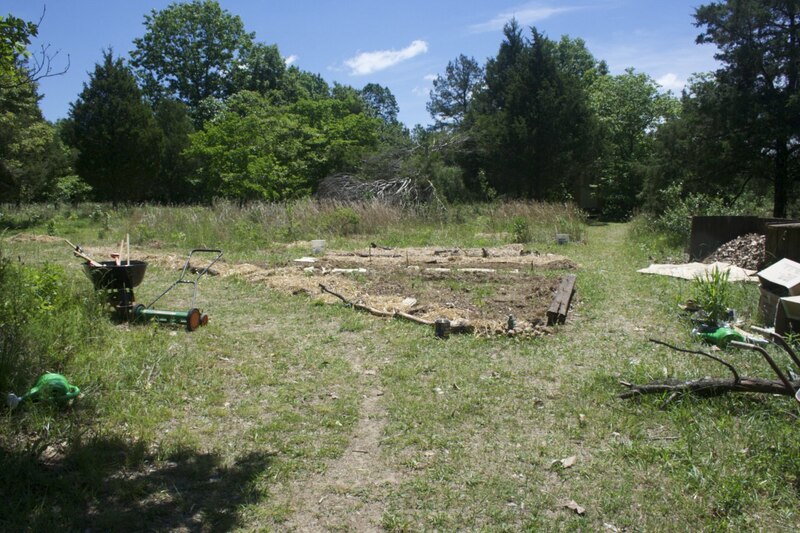 Saturday morning we finished clearing the site of debris and started the floor platform made of treated 2×12, 2×8, and plywood. That was finished by Saturday evening. My back was already hurting. Sunday morning started early with building the 2×4 walls. By Sunday afternoon we had the outer wall panels up. By Sunday evening we had the roof on and had the holes cut for the windows. We had a blast and had squeezed in more than 28 hours of work in 2 days and an evening. We were exhausted. We left Sunday evening after dark and I have no idea how we got home. Somehow Greg managed to stay awake while he was driving though I have no idea how. 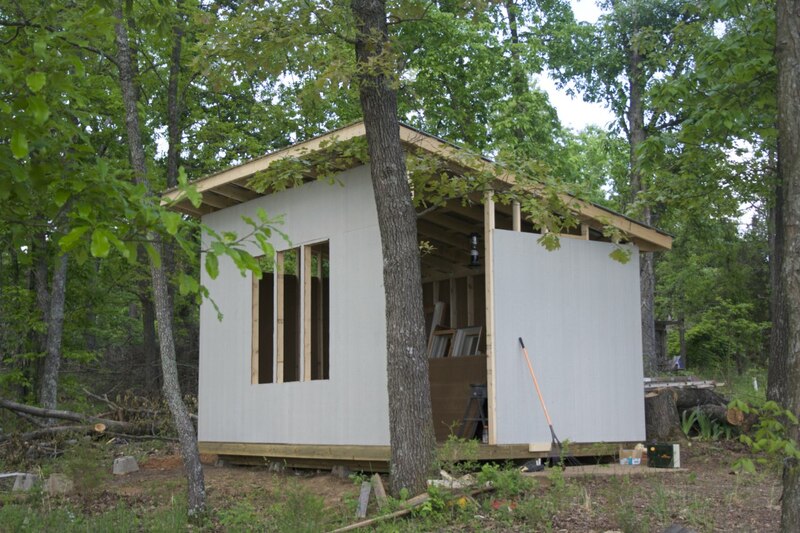 The second weekend was adding in windows, door and electrical. I actually moved in at the end of the weekend because while it was far from finished it was a pretty weather proof shelter. It was like being in a tent except the eaves were not yet enclosed which meant flying critters got in. I woke up to a bird in the cabin one morning. There were a few flies, june bugs and other assorted winged creatures including a couple of birds that popped in one morning. There were mice. While I had my cabin ready for electric we did not yet have service hooked up so I would be using lanterns for a couple weeks. But it was home and I was happy to be in it. If that meant sharing it with a few critters well then, so be it. I was eager to get started on the garden. I had several trays of seedlings that we’re going to need a home and my garden consisted of a small field grasses and flowers. Nearly finished on the outside! The next couple of weeks were spent alternating between gardening and building. On weekends Kerry and Greg would come with the kids and we would build while the kids played. They’d not had a whole lot of time at the lake up to this point and were just getting to the age where they could explore a wee bit. 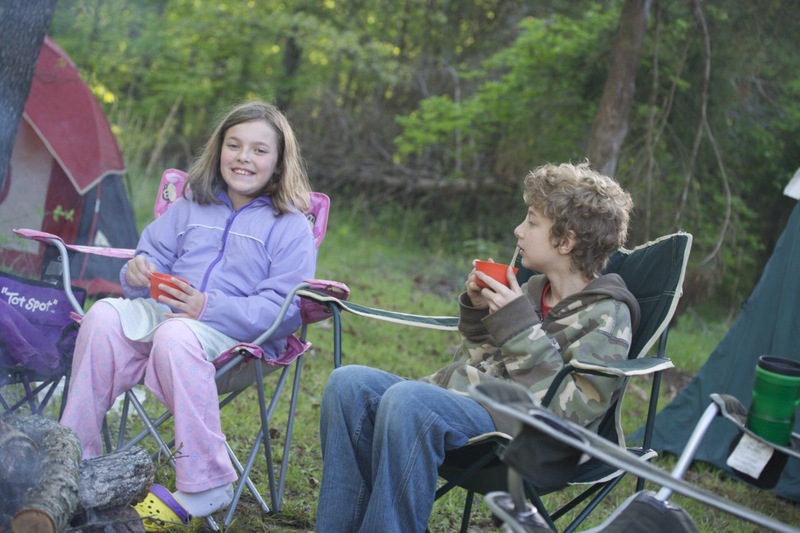 Mornings were spent around the campfire then we’d break off to work on the cabin and the kids would fish or swim with Kerry. By the last weekend of May the cabin was painted and mostly enclosed. By the end of June we’d gotten the cabin fully enclosed, the cabin painted, a ceiling fan installed and the wood slat ceiling was in place. My weekdays were spent gardening and cleaning up the various bits of debris left from a tornado that passed through 2 years prior. I refused to use any gas tools with the exception of a chainsaw. All the darkening was accomplished with a mix of labor and time. I cleared out the garden area with a sickle and then an old fashioned non-gas reel mower. My family thought I was nuts but I put it down to idealism. It took longer to do it the way I did but it was great exercise and frankly, I enjoyed it immensely. The spring, summer and fall of 2008 might be best described as pure joy and exhaustion. In my 39 years I had never worked this hard. I’d always worked, always kept busy but never had I physically worked from sun-up to sun-down. I fell into bed each night aching and exhausted. I was gaining a whole new appreciation for what life would be like without modern conveniences, without oil. Forest garden and orchard. Fencing up, beds in, compost pile underway. I had a small garden going by the middle of June. I considered it garden phase 1. In a month I had put up fencing, put in double-dug beds and mulched it all with cardboard and straw. Greg had begun picking up fruit trees on sale at the big box stores towards the end of June and they needed to get planted. 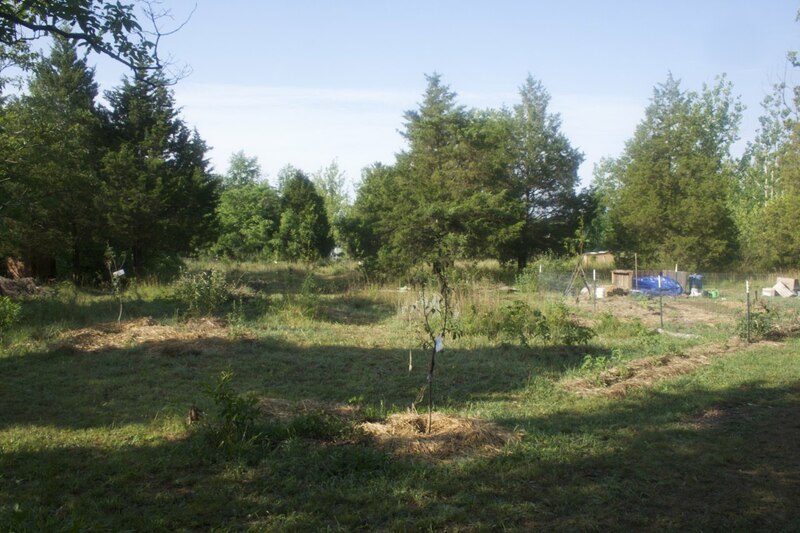 I sickled and reel mowed pathways into a couple of areas I had planned for fruit trees. 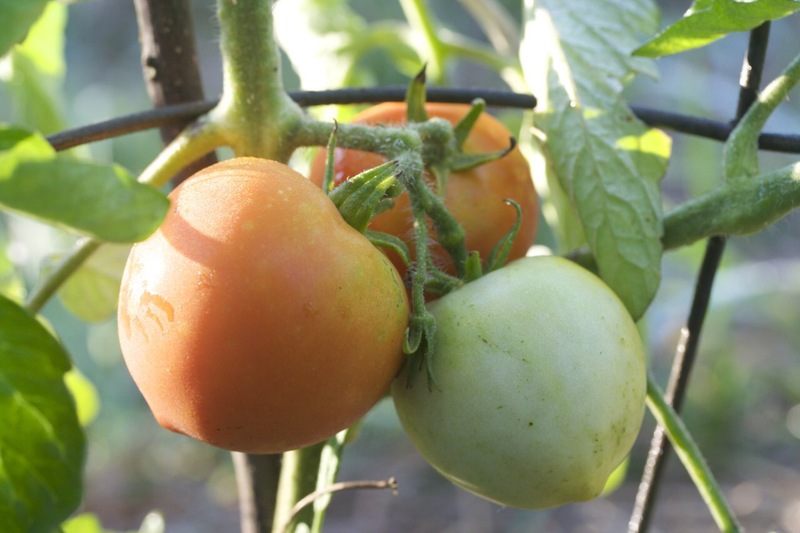 July and August will remain a blur of planting fruit trees, hauling lake water in 5 gallon buckets and weeding the garden. I’m happy to say that I didn’t loose a single tree which is saying something because these were all pretty neglected when they got here as they were sale trees that hadn’t sold at Lowes and other places. By the end of July we had a mix of peach, plum, apple, and a single pear, about 15 all together. In mid summer Greg and Kerry found a good deal on a shed that would become the base of their cabin. We had the shed hauled from 60 miles away and added it to our budding mini-village. It’s a work in progress that continues today with plans to close in the current porch and add a new porch of recently salvaged decking. At some point in mid summer I also began clearing out the lake front which had a downed tree covered in tall grass and flowers. There was another tornado downed tree behind my cabin and damaged trees all around the area. I gradually removed branches and cut the fallen trees down to firewood sized logs and sickled away the tall grass. Yes, this was the summer I finally became familiar with the chain saw. Previous to this I’d only ever used a chainsaw a handful of times. I was never comfortable doing it in part because I did it so infrequently. By the fall of 2008 I’d racked up many back-breaking hours with my new friend, an old red Homelight which I’m still using today. It had been my dad’s but he loaned it to me and then gifted it when he saw that I was actually using it far more than he had occasion to. It’s not the biggest chainsaw but big enough to handle small to medium tree trunks. By early October I had one or two ranks of wood chopped and ready for winter and the lake front was cleared enough that I now had a mostly unobstructed view of the lake. 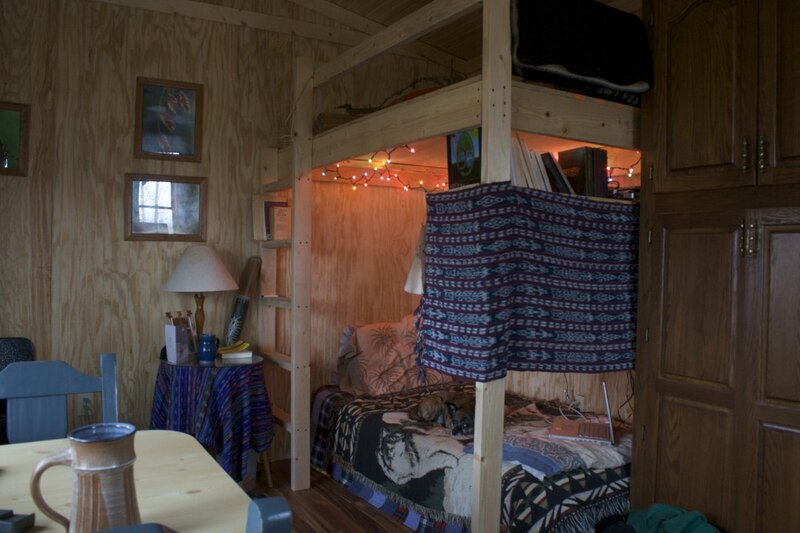 Greg had come down several more times through the summer and in early August the walls had all been insulated and finished with wood paneling. As the leaves began to turn to their fall colors we put a bed and storage/guest sleeping loft followed by the wood stove. One of the last projects of the year was putting in some salvaged cabinets and a closet with some shelves and a countertop. My “kitchen”, improvised for most of the summer, started to look like a real kitchen. For much of the summer I’d used an outdoor sink set-up that functioned pretty well. But as the cold weather would be coming soon I decided it was time to move the dishwashing inside so we put in a sink though no running water. I used 3 five gallon water tanks hauled from our well house, usually just one a day. I had always been conscientious about my water use but when I was hauling all of my water by hand I can tell you I became even more careful. This was especially true in the winter when I was hauling the water 150 feet through the snow. The summer of 2008 was busy but we were just getting started. This entry was posted in Living Simply and tagged Construction, Homesteading, Permaculture, Tiny House on July 21, 2016 by Denny. 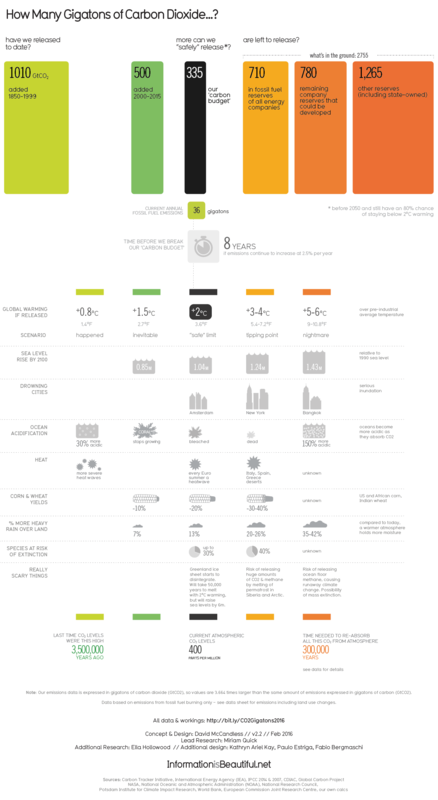 This is, without a doubt, the best climate change infographic I’ve ever seen. The perfect starting point for a conversation with friends or family that have not taken the time to consider the scope or time frame of the climate change crisis. How Many Gigatons of Carbon Dioxide? 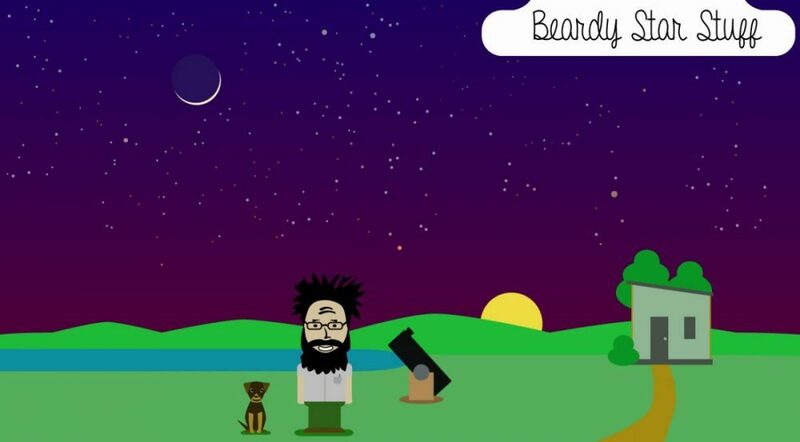 You should definitely swing over and check out the site. They give additional infographics as well as source information for this one. This entry was posted in Climate Change, Design on July 1, 2016 by Denny.